The traditional 21 Romany Layout has been around for a long time and is quite popular to this day. The traditional Past, Present and Future rows consists of 7 cards in each row. Each column (7 of them) has assigned meanings in the version I am going to write about. In my 12 card Trigger layout I explain that there is a past, present and future to the past, present and future. You will see this technique demonstrated very nicely in the Romany layout Reading below. 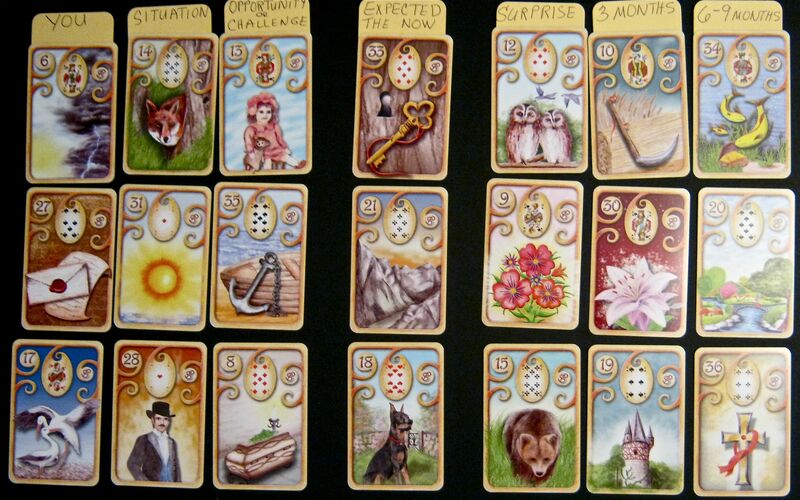 To illustrate the 21 card Romany layout I am featuring the stunning Magisches Lenormand. In case you want to try this version of the Romany layout let me explain a few things first. The TOP row is the PAST. The 3 left cards are distant past. The center card is similar to a trigger card. The 3 right cards are recent past. The MIDDLE row is the PRESENT/CURRENT. The 3 left cards are distant current. The center card is similar to a trigger card. The 3 right cards are recent current. Tips: The reading is for a female. You will notice that the Lady card has not appeared anywhere in the 21 cards. This means the female is not overly concerned about her past, present or future. She might care but isn’t obsessing about it. Also, the Gentleman does show up. He is in the 3rd row (future), column 2 (situation) AND he falls in the near future of the future row. Most likely the time frame is within 3 months if not sooner. This does have some importance. Next – look for theme or category cards. If you had something specific on your mind locate the card which you think represents what’s on your mind. Where is it? You can determine the circumstances around it being studying the row and column. What if you are thinking about the male represented by the Gentleman. Well, you already know where he is in the layout. The STORK and COFFIN have him caged in. Look to column #1 to see that the STORK falls in the You column. Changes of course, within you towards him or because of something he did. The COFFIN falls in column #3 Opportunities or Challenges. The changes will induce some endings in the near future as these 3 cards fall to the left of the center card in the center row. What brought on these changes of the STORK? The CLOUDS & LETTER cards are positioned in column #1. The female (you column) obviously shared some unclear information with the male which created this shift in attitude. Follow me so far. 🙂 I won’t be doing the entire reading I just want to offer some tips in understanding the rows and columns. The next column I want to study is the #6 – 3 months. The TOWER card falls in the group of 3 cards to the right of the center column indicating distant future. Since it falls in the 3 month column we have a specific time frame. Before I would even attempt to make a prediction of those cards and mainly because of the SCYTHE’s influence I would study the Surprise column #4 to see what the unexpected influences were. If you want you can Read the entire Past row, followed by the Present row, finishing off with the Future row. Then you can proceed to columns, etc. I look for the Significators first, then themes, then the cards of test but it depends if you have a question on your mind at the time of shuffle. Thank you for sharing this. Wish you had time to do the whole reading. 🙂 Anyway, what affect does the trigger card have on the rows, if any? Or, it’s purpose, I should say… Thank you again ! I have Le Jeu du Destin Antique 32 cards. Yesterday, I have an interview with it. I spread 9 cards as the image below. I don’t know to read it. Please help me understanding the meaning of this spread. Thanks. Position 1: 8 of spades; 2: 9 of Clubs reverse; 3: The Jack of Hearts reverse; 4: 7 of Hearts; 5: The Queens of spade reverse; 6: Ace of Hearts; 7: 8 of Clubs reverse; 8: 10 of Diamons; 9: The Queen of Clubs. Hi: Thanks for your question. The Romany Layout can be used with any deck of cards including the Le Jeu du Destin of 32 cards. I am not sure what layout you are doing with the 9 cards you are mentioning. I assist individuals with readings only as a post on my blog for others to read and learn as well. So if I interpret these cards they will be a post. Thanks for your reply.I used the method of layout from the manual book of Pianik follow this deck. After suffle the cards in my left hand, I extract 8 cards and layout the ninth card face-down on the table and continue to the nine cards in 3 rows, 3 pile randomly. This spread denotes past, present and future. That is all. May I ask you more question? If I want to know about the situation of my job or finance at the time and what is must doing? How I can use your layout? Thanks. I use this spread with Tarot, cool to see it works with Lenormand as well. Thank you for your comment. The Romany Layout probably works well with many different decks which are “fortune telling” style decks. I found that the Symbolon cards are a bit more challenging to read in this layout because they are so unique to their own system. Seaqueen. Can you explain us how to read the trigger cards please? Not sure if you mention this, but do you lay out the rows across ie cards 1 – 7 the past cards first OR do you lay the columns down? I have seen instructions both ways.